This secured loan agreement is for use when borrower is a company or other corporate body, or a trust. 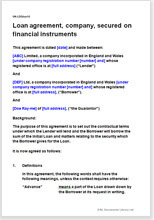 It is drawn so that lender is also a corporate body, but the lender may as easily be an individual or a trust. It is drawn primarily to protect the lender, but if you are the borrower, you have the opportunity to edit any point you would prefer not to include. The agreement may be for a loan by a family member to her nephew’s business; by a business angel who has also taken shares; simply an arm’s length “investment, or any other. We have provided for both a personal guarantee and for other securities. That may be more than the lender needs. If the right person, or people will give a guarantee, that is more powerful that other forms of security. The security could be any property which is not physical nor personal: shares, other tradeable security; shares in the borrower itself, and so on. The loan is “secured” by the borrower lodging documentary securities with the lender. Where there is no paper copy of evidence of ownership, this document provides the evidence that the item is “secured” to the lender. If the value of the security falls below a specified level, the lender can call on the borrower to top it up. In addition, at any time, and without giving a reason, the Lender may call upon the Borrower to transfer title to any or all of the Securities to him. If there is no accepted system of registration of ownership, that is the only way the lender would be protected if the borrower went down. (The reason for the transfer should be set down in a letter so that the security can be passed back to the borrower when the loan has been repaid, without tax or other problems). Because the borrower is a company, we have included a small raft of warranties. These take effect as promises by the borrower as to aspects of its financial state. We have also provided that the signatory accepts personal liability for his proper authorisation. To some extent that person is bound in the same way as the company. The agreement could be whatever you want to put in it, but we have provided a sound and comprehensive proposal containing many options. It is supported by extensive drafting notes so that you will know whether you can safely delete some provision. It is most unlikely that you will want to add new provisions, but if you do, it is easy. Our layout and use of plain English makes it very easy to edit by deletion. Drawn outside the National Credit Act 2005, this agreement is not suitable for companies in the business of lending or providing credit to consumers. Promise by borrower to make no change to capital structure. An option on possible assignment of the rights and obligations set up under the agreement.